What are they? 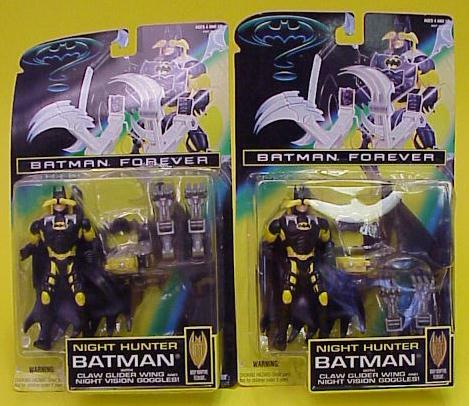 The figures below are some of the first packaged toys from their series release. 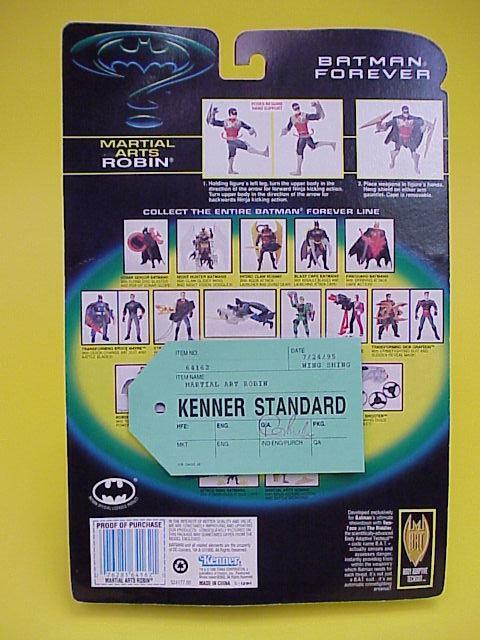 Many times there would be variations and errors by the Kenner factory that would not be noticed until the toy was packaged. 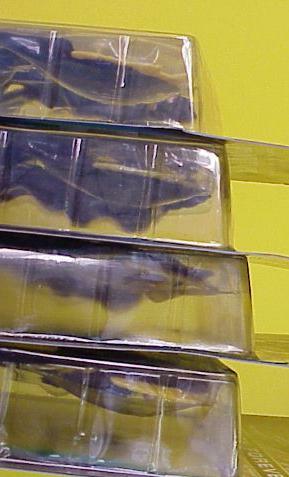 Some variation examples are: figure painting, plastic bubbles, plastic trays, paper inserts, missing text , too much text, etc. 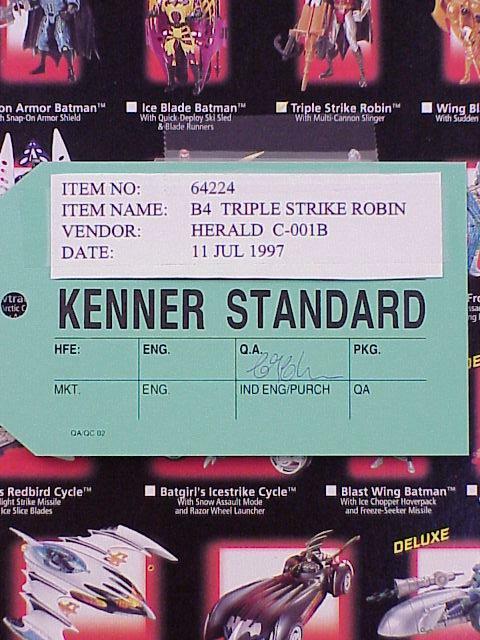 An inspector looks at each release to make sure it meets a Kenner standard. 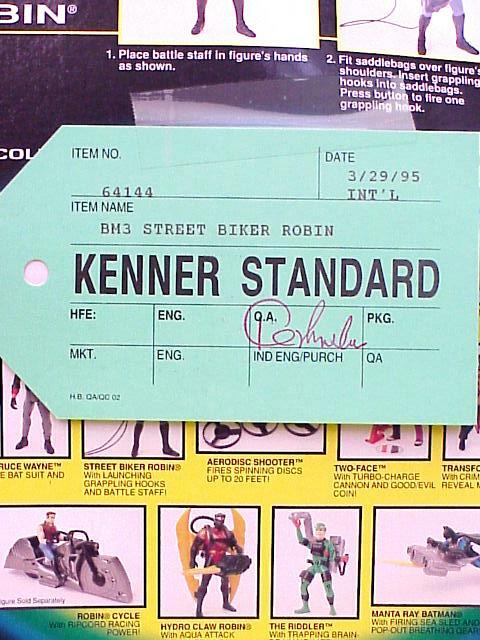 Once the errors and variations are found, the inspector uses green " Kenner Standard" tag to write what needs to be changed on the package or to the figure itself. Then the changes are made at the factory to fix the errors. 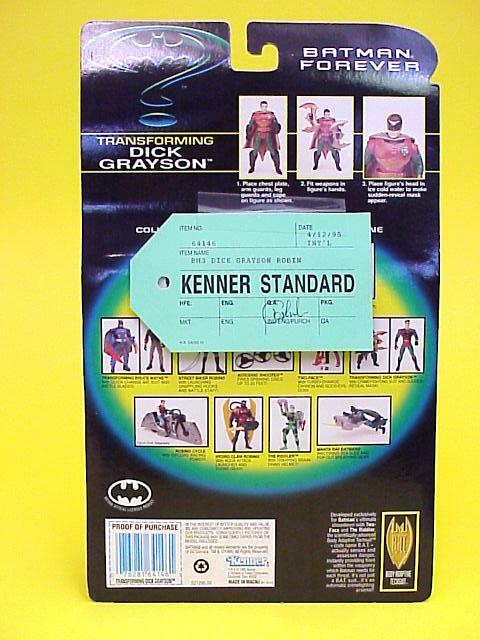 As you can see, these carded figures go through a lot of handling. Most are in nice shape, with some self wear due to handling. 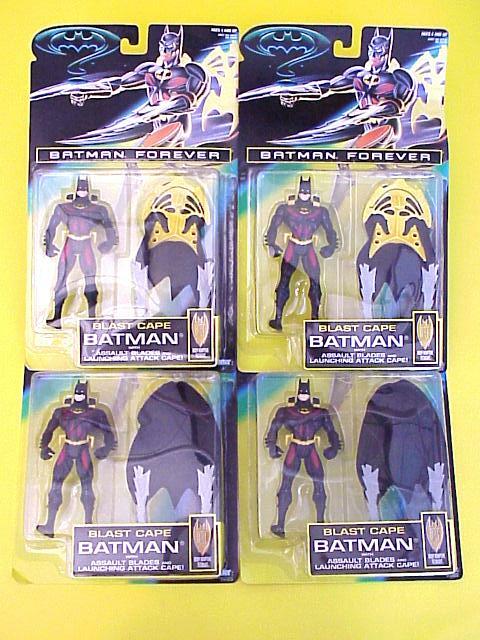 These Batman variation figures are sure to be a highlight in any collection. 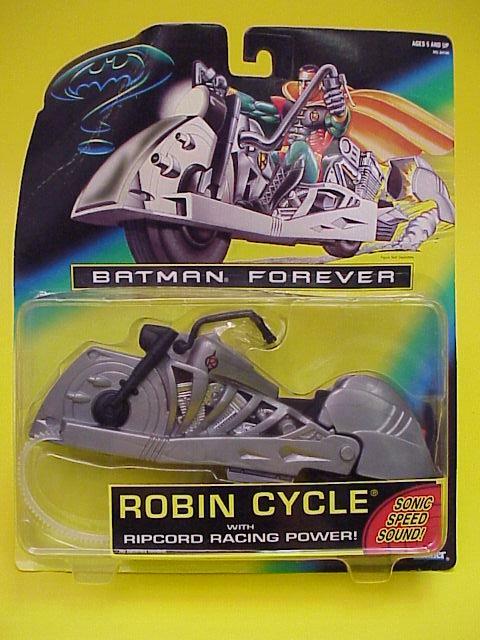 No Batman collection should be without one. 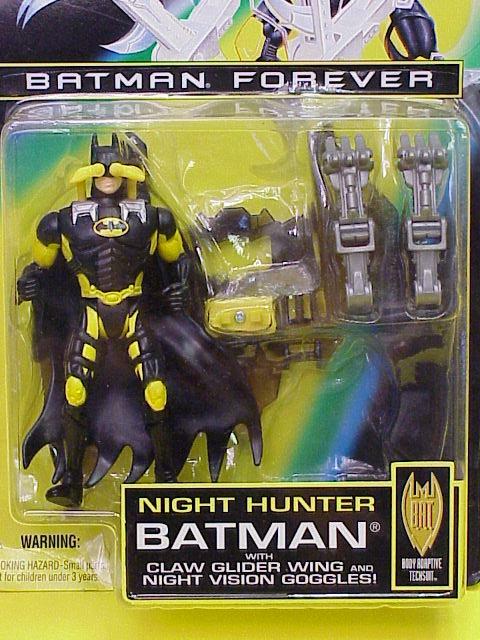 Night Hunter Batman with Claw Glider Wing and Night Vision Goggles from the Batman Forever toy line. 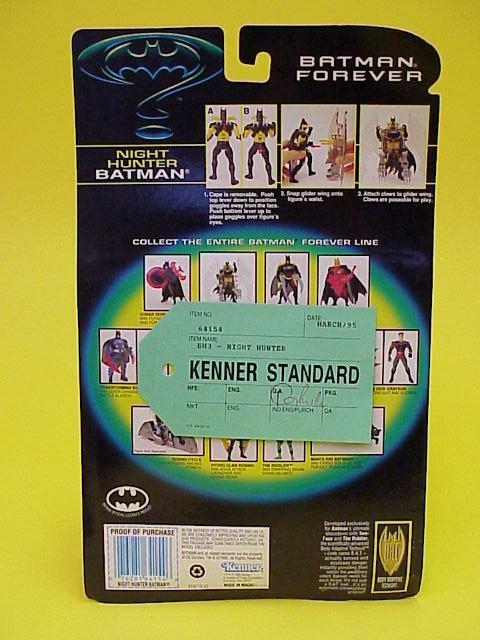 We have two that have a "Kenner Standard" tag with the card. 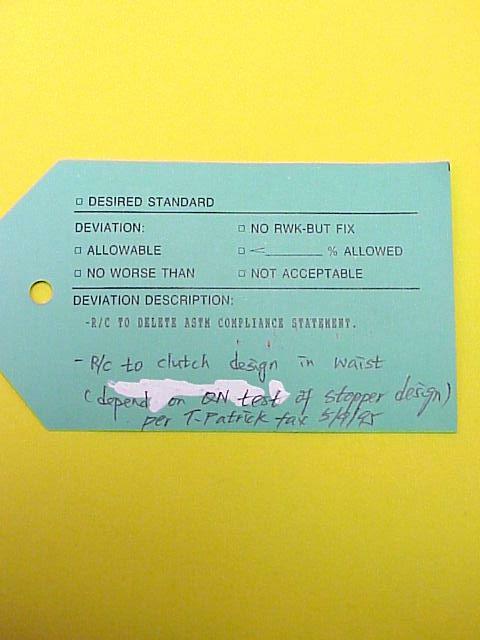 These tags are used to list deviations from the standard and to be signed acceptable. 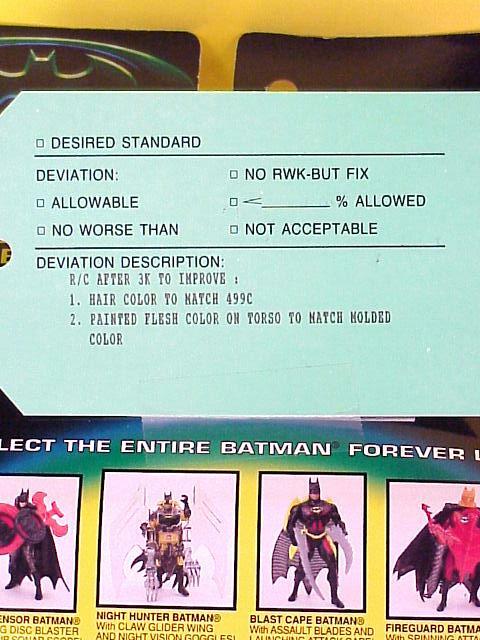 The first tag has no deviations listed. The second tag states "CLAWS MOVED DOWNWARDS, ALL OTHERS UNCHANGED". 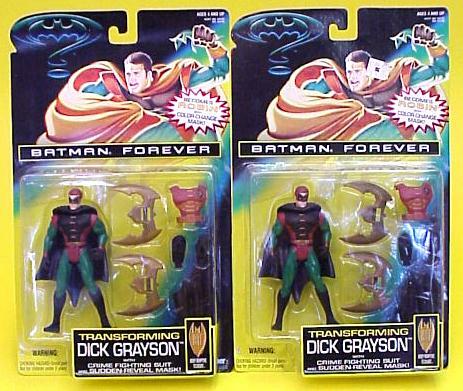 We have pictured the two versions here next to each other. 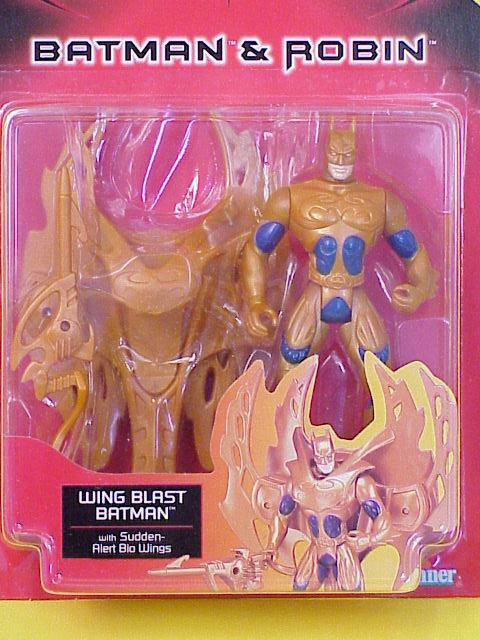 The second version does have a different bubble insert that places the claws at the bottom of the bubble instead of the top. 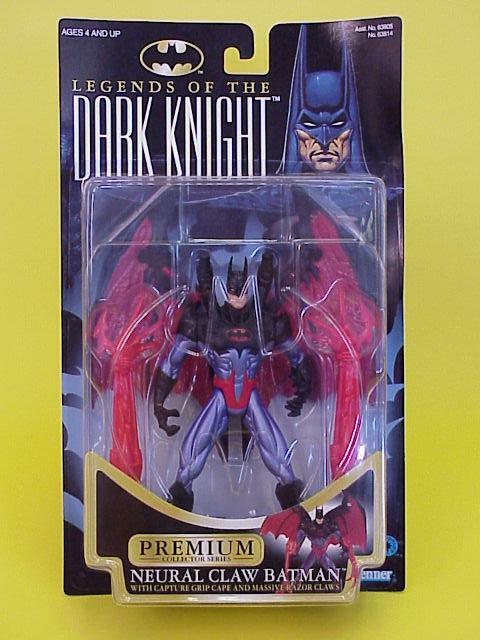 You will receive both figures mint on card....39.99 for both carded figures. 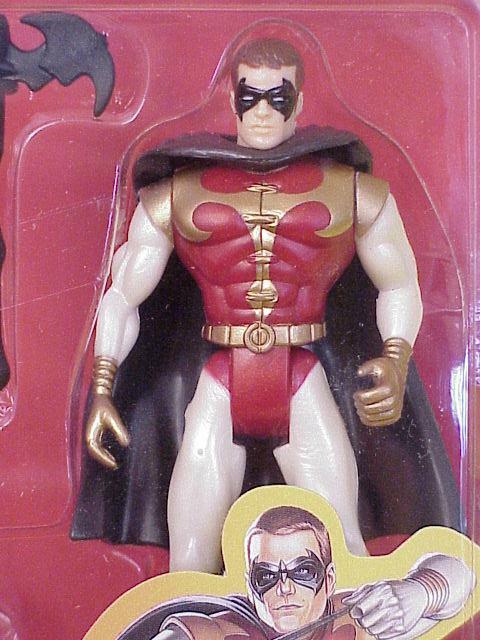 Buy the prototype of this figure HERE ! 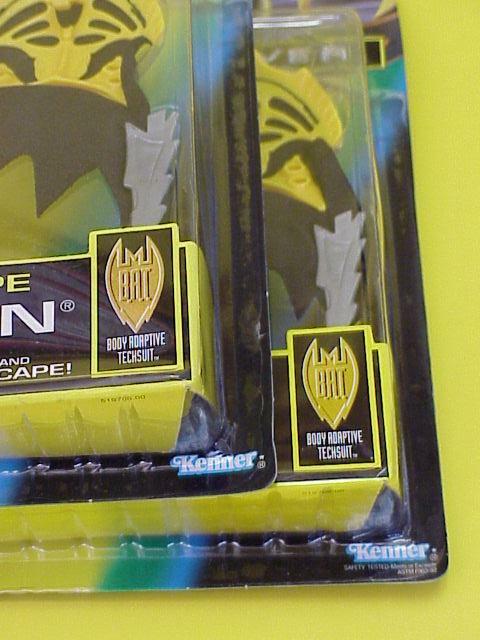 Blast Cape Batman with Assault Blades and Launching Attack Cape from the Batman Forever toy line. We have 4 examples of this figure that are different in some way. 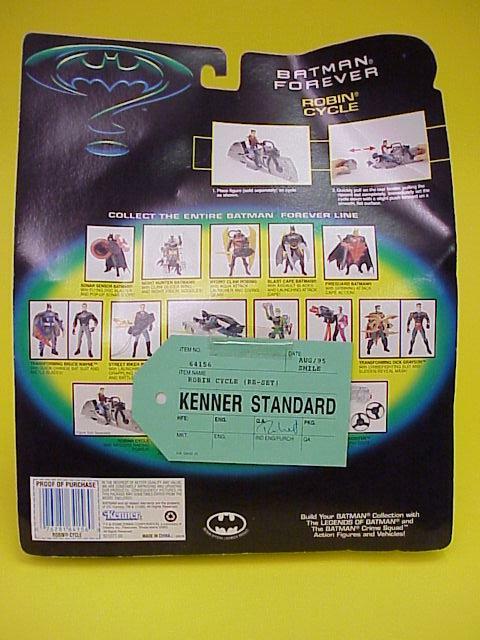 Two of them have a "Kenner Standard" tag on the back of the card. 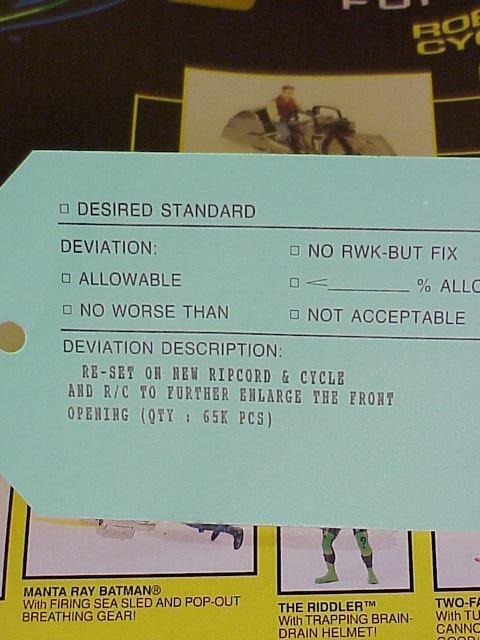 These cards are used to list deviations from the standard and to be signed acceptable. 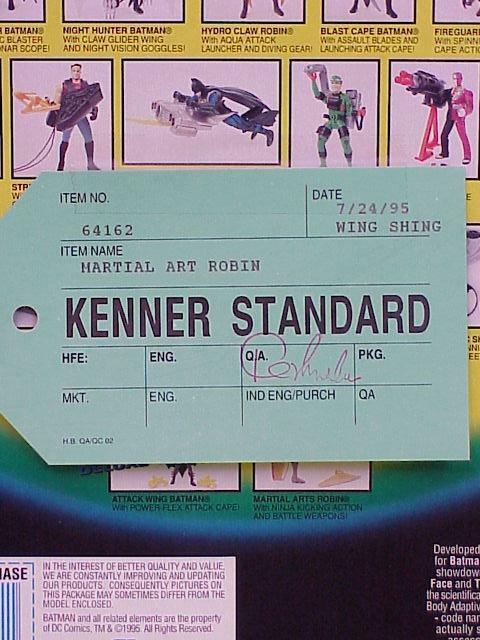 One tag states "RESET-STD - INCREASE THE AMOUNT OF YELLOW EXPOSED ON THE FRONT OF SHOULDER DEFLECTORS PER KENNER ENG - MIKE FAX DATED 3/17/95". The other tag states "-ADJUST BLISTER LOCATION TO PREVENT PROTRUSION OUT OF CARD EDGE. FM PC1. 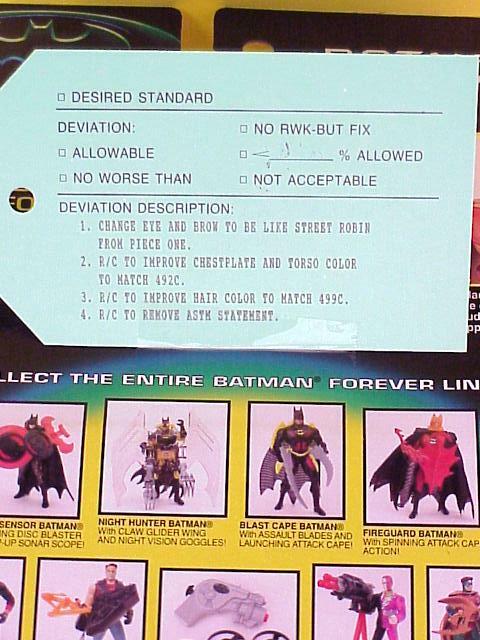 - R/C TO MODIFY GAUNTLETS FITTING W/VERTEBRAE AS INDICATED ON BLISTER CARD (QTY:3K PCS)" Two of the figures have the cape inserted yellow side forward in the bubble insert, and two figures have the cape inserted black side forward. On the two with the yellow side forward, one has an ASTM statement in the bottom right corner of the card, and one does not. On the two with the black side forward, the bubble insert is slightly different behind the cape area, but they both have ASTM statements. We have pictured all four versions here. 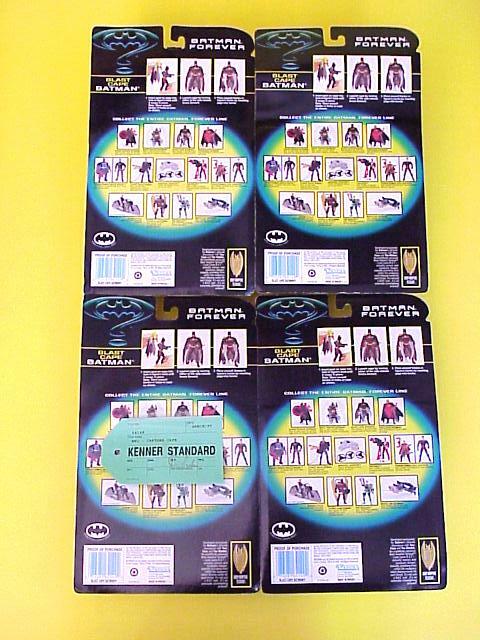 You will receive four figures mint on card - each different in some way than the others...79.99 for 4 carded figures. 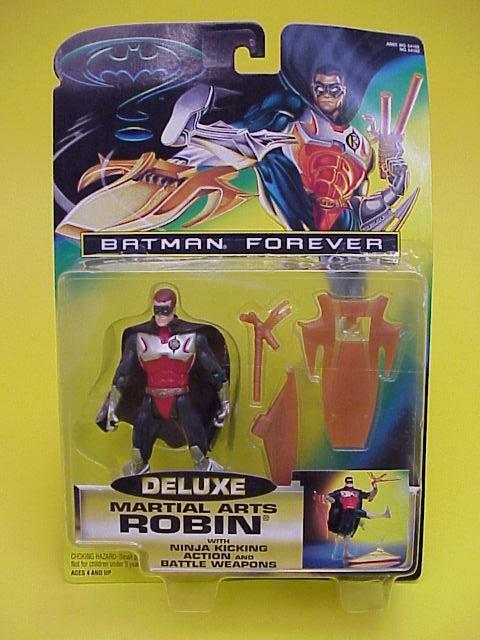 Triple Strike Robin with Multi-Cannon Slinger from the Batman & Robin toy line. One of the cooler variations ( see section set of pics). 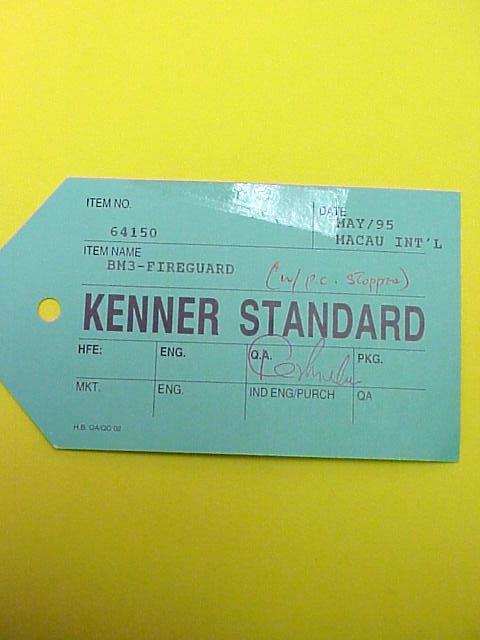 We have two with "Kenner Standard" tags on the back of the cards. 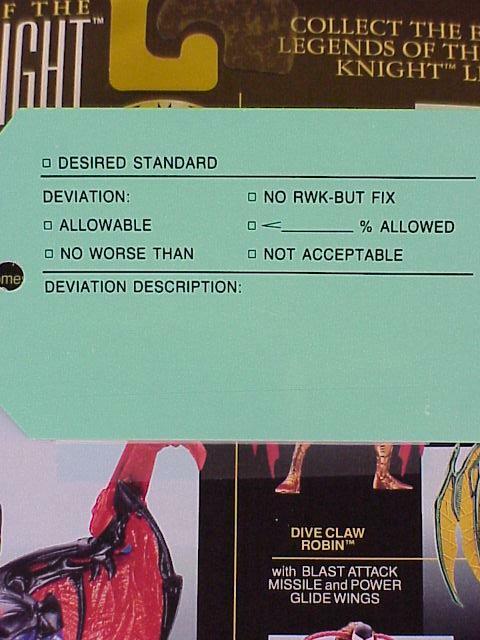 These cards are used to list deviations from the standard and to be signed acceptable. The first card states "COMMENT: 1. 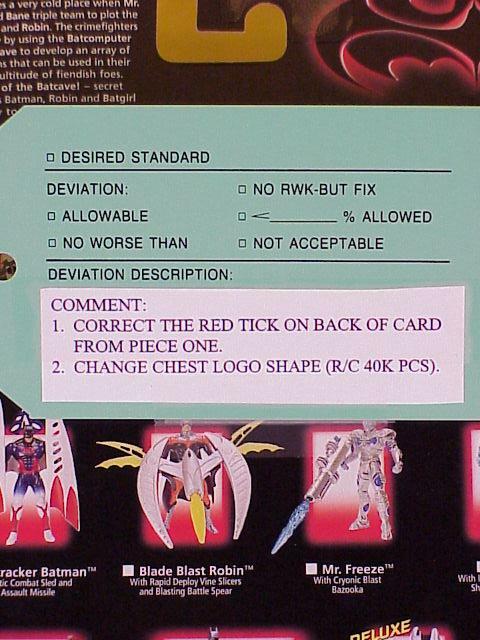 CORRECT THE RED TICK ON THE BACK OF CARD FROM PIECE ONE. 2. 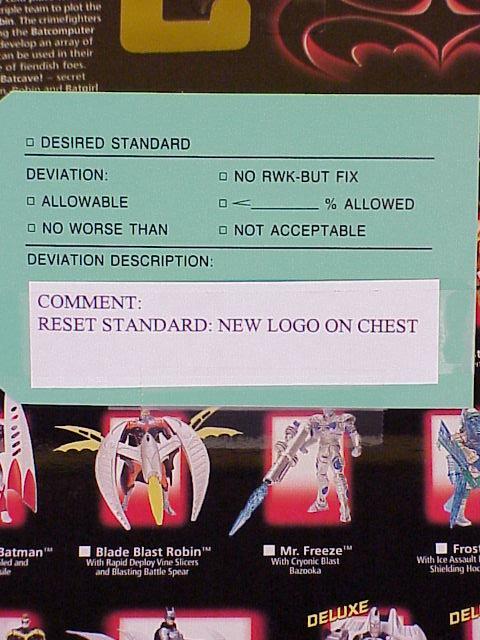 CHANGE CHEST LOGO SHAPE (R/C 40K PCS)." The second card states "COMMENT: RESET STANDARD: NEW LOGO ON CHEST." On the back of the first card, the wrong figure has a red check mark next to it. 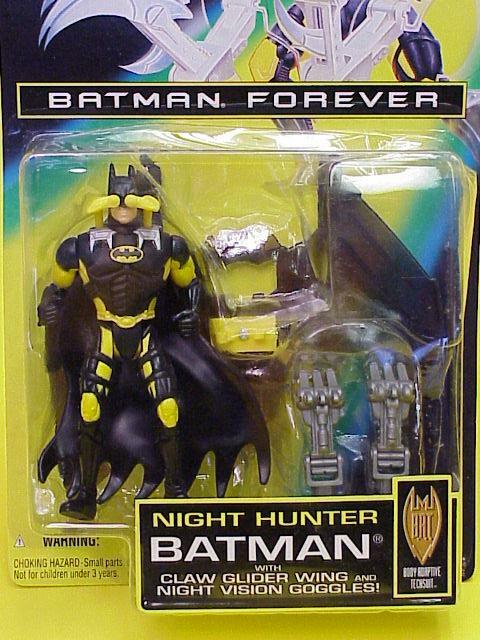 It is the Neon Armor Batman instead of the Triple Strike Robin. 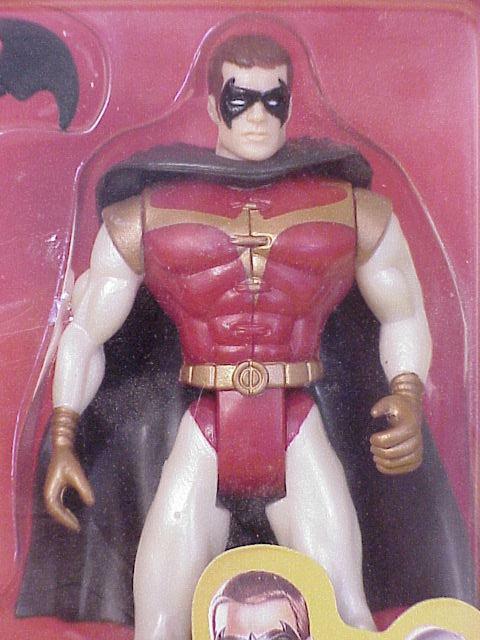 This has been corrected on the second card, and Robin's chest logo is different on the two. We have pictured the 2 variations next to each other. 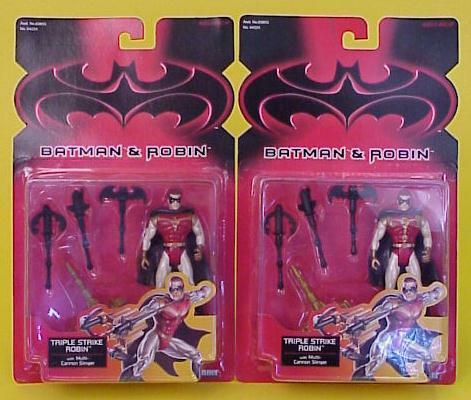 You will receive both figures mint on card....44.99 for both carded figures. 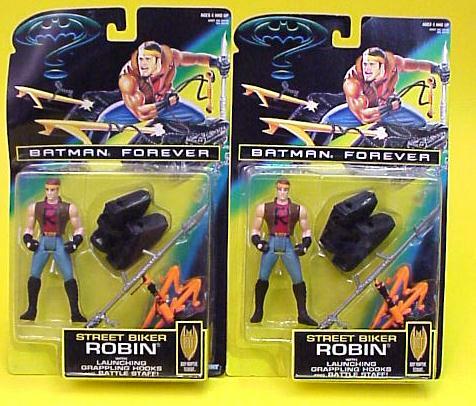 Street Biker Robin with Launching Grappling Hooks and Battle Staff from the Batman Forever toy line. 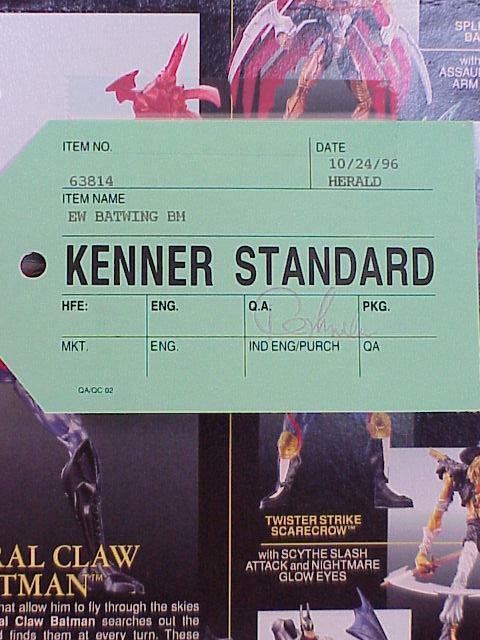 There is a "Kenner Standard" tag on the back of the card. 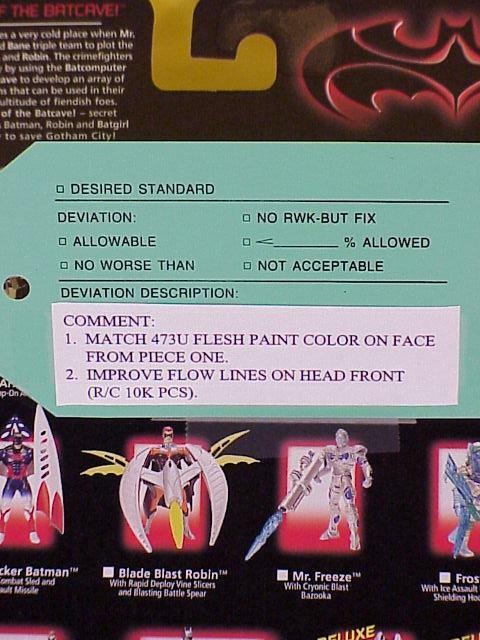 These cards are used to list deviations from the standard and to be signed acceptable. This card states "R/C AFTER 3K TO IMPROVE: 1. HAIR COLOR TO MATCH 499C 2. PAINTED FLESH COLOR ON TORSO TO MATCH MOLDED COLOR". R/C stands for running change - changes that were made while production was already under way. This means that there would be a running change after 3,000 pieces. 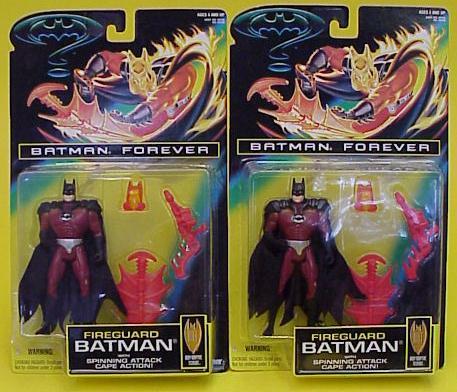 We have pictured the variation version here next to the production version that we had in stock. The hair color is slightly darker on our production version, though the flesh color doesn't appear much different. 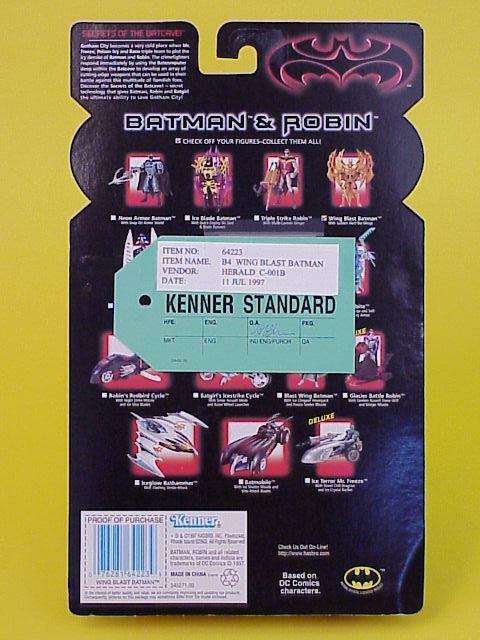 You will receive both figures mint on card; one with lighter hair and Kenner Standard tag, and one with slightly darker hair.....34.99 for both carded figures.